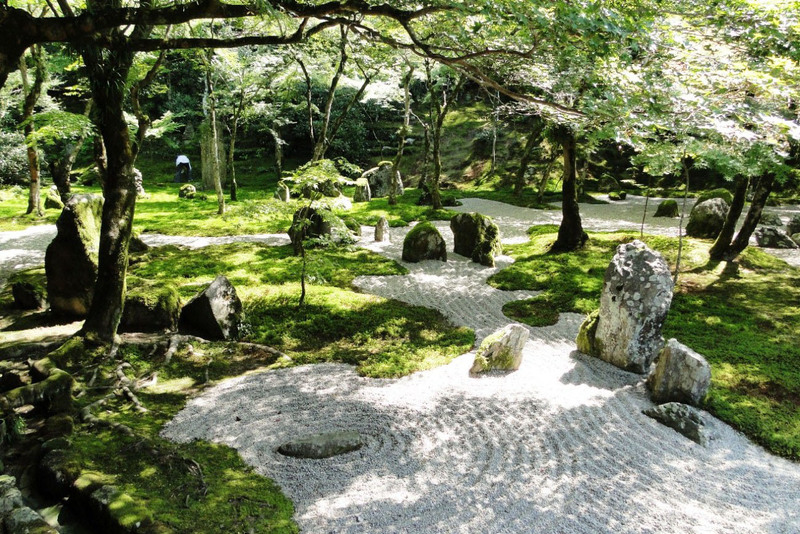 The gravel of a path in the garden at Komyozenji Temple has been swirled into the shape of the kanji for “light.” It’s a bit of an ironic choice for the fall day I visit, as only a few of the sun’s rays have managed to penetrate the dense growth surrounding the rear of the temple. Those that do filter through the red-tinged maples, though, bathe the garden in an ethereal glow befitting daybreak rather than the near-noontime it actually is. I turn to the other visitor on the temple’s back porch, poised to share an observation, but the words die unsaid in my throat. To voice them would be to break the silence of this restful place and, after a few days in nearby Fukuoka’s bustling downtown, silence is suddenly a commodity not to be trifled with. 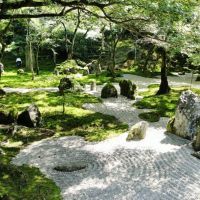 You don’t necessarily have to leave Fukuoka to find an oasis from urban commotion, but many do, choosing to hop a train and head a mere half-hour south to the wooded temple enclave of Dazaifu. Oozing serenity and small-town charm, it’s hard to ignore comparisons with Kamakura — both boast temples, old-fashioned tourist shops and pilgrims on the hunt for spiritual enlightenment. 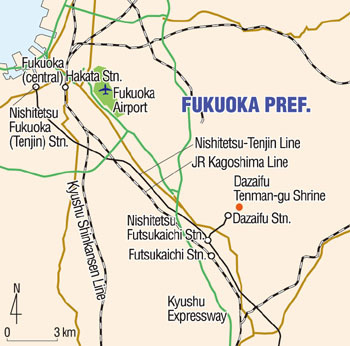 And though Kamakura was, from 1192 to 1333, the seat of Japan’s first military government, Dazaifu — hidden away in the backwoods of Kyushu — was for its part an important seat of regional government in the preceding Nara and Heian periods that spanned the years 710 to 1185. Throughout those centuries, indeed, Dazaifu was poised to be the first line of defense if ever Tang Dynasty forces from China, or ones from the Korean kingdoms, got antsy about expansion. Meanwhile, on a more spiritual plane, the town lomg ago too became the center of Buddhism in Kyushu, as exemplified by the construction, between 663 and 746, of the magnificent and sprawling Kanzeonji Temple. Today, having been repeatedly ravaged by fire, the temple is but a vestige of its magnificent former self — though it is still home to the oldest temple bell in Japan, a bronze masterpiece cast in the late 7th century. 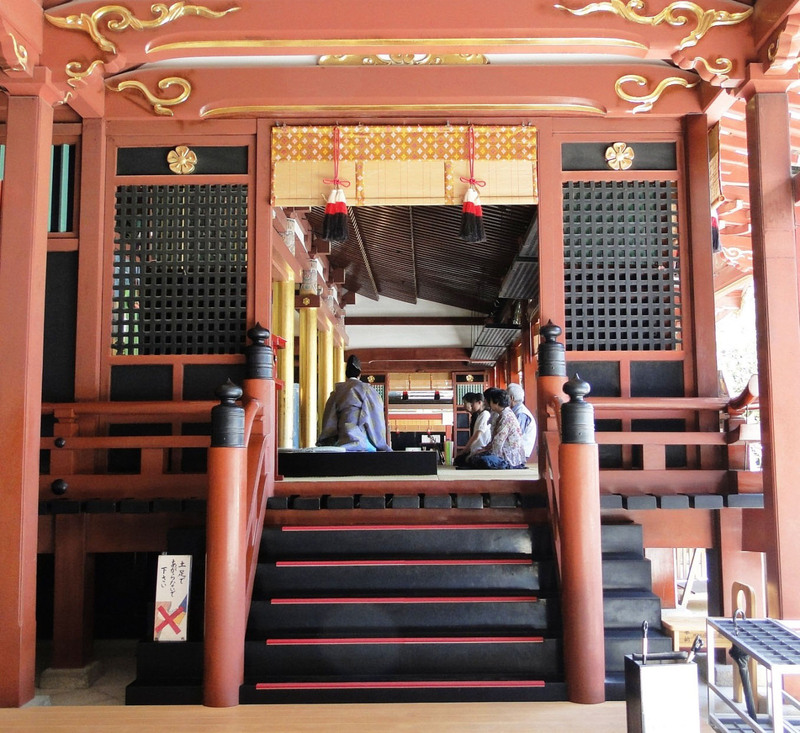 Perhaps most importantly, though, Dazaifu is host to the enduringly popular Tenman-gu Shrine. Only a few hundred meters away from Komyozenji Temple, this much-visited, sprawling complex was constructed over the grave of Michizane Sugiwara (845-903), a top government official at the Imperial court in Kyoto who was sentenced to permanent exile in distant Dazaifu in 901 after losing out to the maneuvering of members of the Fujiwara clan, his political rivals. 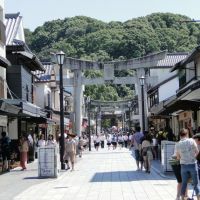 Relative to the splendors of the capital, Dazaifu was then — and, some would argue, still remains — a rather rustic backwater, and the humiliated Michizane never recovered from his fall from grace. But, as a consummate scholar, he spent the few short years of his exile until his death in the pursuit of knowledge — so earning him the honor of being enshrined as a deity of education. Even today, students of all levels make the journey to Dazaifu to pray or to purchase charms that might boost their chances of academic success. 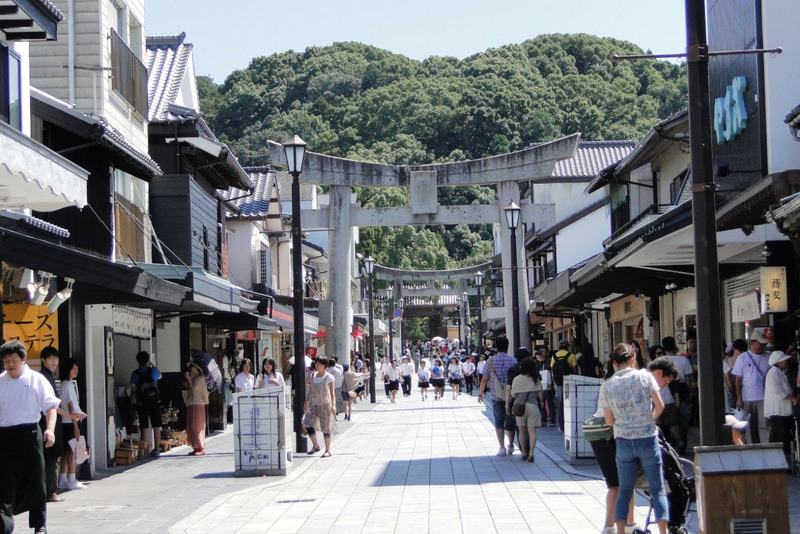 Indeed, I can hear the hubub of crowds milling around Tenman-gu’s grounds as I retrace my steps down a backstreet from Kyomozenji’s gardens to the town’s train station — this time to prepare my approach properly and proceed up Dazaifu’s primary thoroughfare. 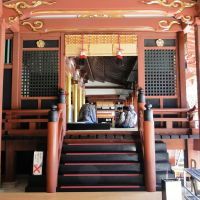 It’s the same route pilgrims would have taken in the Edo Period (1603-1867), when the main hall of Tenman-gu Shrine was rebuilt and enterprising merchants set up shops to capitalize on the surge in visitors. Today’s pilgrims might sport expensive loafers instead of clunky wooden geta sandals, but the shops sell mostly items from days gone by — carefully stitched kimonos and complementary obi sashes, hand-made paper products and wooden uso (bullfinches). These bird figures play an important role in the shrine’s well-attended annual Usokae festival in January, when believers gather to pass around small statues of the red-breasted songbird. The hope is to receive one of the golden bullfinches the priests of Tenman-gu Shrine add to the inanimate flock, since those are said to assure recipients of good luck in the coming year. 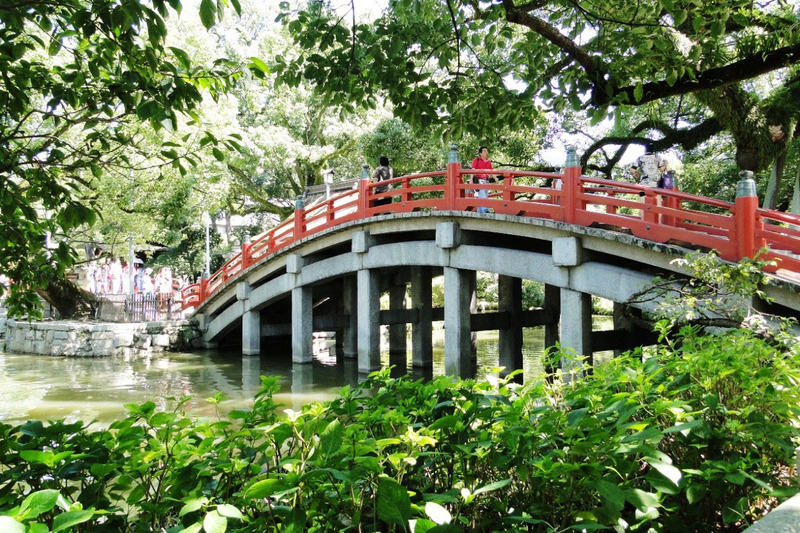 At the end of the main street, a three-part bridge marks the entrance to Tenman-gu Shrine. The first and last sections of the scarlet bridge are arched, while the connecting middle part is horizontal — parallel to the shimmering pond it spans. The architect’s explanation, written on a nearby panel, is fraught with symbolism. However, most of those around me are too focused on feeding the pond’s regal swan guardians to pay much attention to the meaning of the boards on which they tread. Tenman-gu’s inner courtyard is a hotbed of activity this weekend morning, yet the careful landscaping of the enclosed area allows for a bit of escape. Narrow ponds and channels filled with fluorescent koi carp cut across the gravel expanse, while delicate saplings and discreetly placed benches offer visitors a place to linger out of the relentless sun. To the right of the honden (main hall) with its impressively thatched roof stands the “flying plum,” the gnarled pride and joy of the shrine. The ancient tree reputedly uprooted itself from the Kyoto soil upon hearing of Michizane’s banishment and flew to Dazaifu to accompany the official. It’s the first of Tenman-gu’s 6,000 plum trees to bloom every year in February, shading the grounds with a canopy of pink and white petals. It’s not exam season, but the shrine is doing a brisk business this morning performing blessings for visiting students and their families. Each group shuffles in through a side door in the main hall and I watch with interest as the priest carries out the ritual. As one young girl exits, her face cautiously optimistic at the blessing’s efficacy, I reflect on how much more successful my years studying calculus in high school may have been with a little divine intervention. Just outside the precincts of the Shinto shrine, an equally worthwhile destination vies for travelers’ attention. Hidden among the trees, looking more like a futuristic sports stadium than a stately institution, is the Kyushu branch of the National Museum. The cool, dimly lit interior offers a welcome break from the heat on a sunny day, and the engaging exhibits — focusing on the history and development of the region within a wider, Asian perspective — can easily occupy a few hours. However, though knowledge is said to be food for the soul, after more than an hour exploring the museum’s exhibits, it’s time to search out a form of more corporeal sustenance. I stroll back down the main street to the Dazaifu Exhibition Hall, where my tourist pamphlet tells me I can practice making my own umegaemochi (fresh-baked buns stuffed with adzuki bean paste and branded with plum-blossom petals). Excited, I ask when the next class starts. “Sorry, but you can’t join a class without a reservation,” the helpful staff tell me apologetically. However, if I’m interested in tasting the local specialty, they encourage me to stop off at nearby teahouse called Kasanoya. Shops selling umegaemochi are a dime a dozen on the main thoroughfare, but Kasanoya’s cobbled entryway filters customers out of the street’s chaos and into its calm ambience of polished wood floors and genial staff. Spurning the delightful interior, I instead choose the coveted seat out front under a parasol. From my post, I have a clear line of sight into the efficient production of Kasanoya’s profitable pastries. The mixing, the pouring, the deft turning of the cast-iron molds … The process is hypnotic. I barely notice that the cake I’ve ordered is soon nothing but mere crumbs on my napkin. But then a sip of fresh chilled barley tea snaps me back to real time and I hurry away to catch my train — refreshed and enlightened from a day in Kyushu’s storied temple town. 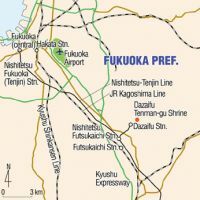 Dazaifu is 30 minutes on the Nishitetsu-Tenjin Line from Tenjin Station in central Fukuoka (¥390, transfer at Nishitetsu Futsukaichi). Entry to both Kyomozenji Temple and Tenman-gu Shrine is free, but there is a ¥200 requested donation to view the temple’s garden. The Kyushu branch of the National Museum is open from 9:30 a.m. to 5:30 p.m. (closed Mondays; last entry 4:30 p.m.). Admission is ¥420 for adults (special exhibitions extra).